A certain theory about contrails holds that these long linear clouds presumably produced as a by-product of high-altitude flight of aircraft are often in actuality chemical weapons being used against the populace. 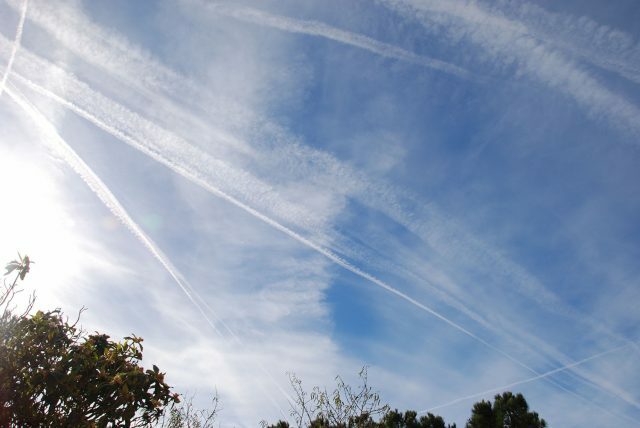 It might sound crazy, but a recent survey revealed that around 10 percent of respondents believed whole-heartedly that chemtrails were a real phenomenon, and 20 percent believed the theory at least in part. Are these folks deluded, or is there something to the contrail theory? The backstory: Anthropogenic, or homogenitus, clouds, are those made by human activity instead of by natural forces. The history of anthropogenic clouds is a long one, dating back at least to the beginning of the industrial revolution, when clouds formed above industrial plants, still a common occurrence today. But by far the most common anthropogenic clouds are contrails, which result from the exhaust from aircraft engines, normally jet engines. Such clouds are formed when the water vapor in the engines’ exhaust combines with condensation nuclei in the exhaust and the very cold air to condense, forming trails of visible moisture (clouds) forming small ice crystals. Contrails are not the only form of aviation-related anthropogenic clouds. At high angles of attack, the air coming off of flap or wingtip surfaces can also form small, short-lived clouds. But contrails are the subject of interest because of a popular, widespread theory that many of them actually consist of chemicals sprayed by unknown actors (governmental bodies are the most usual suspect) in order to influence human behavior in some form. The most popular theories are that these purported chemtrails are used as biological weapons, for weather modification warfare, as weapons of psychological warfare, or as a means to limit human reproduction. The Argument: Proponents of the chemtrail theory are often dismissed as conspiracy theorists, but could there be some truth to their theories? Point One: Chemical warfare is sadly not a new phenomenon. It has been used in various forms for thousands of years: Poison-tipped arrows are a form of chemical weapon. The use of such weapons arguably reached their peak during WWI, when countries on both sides of the trenches used chemical weapons, including chlorine gas and mustard gas, resulting in more than a million causalities, many of them civilians, and in Germany during WWII, the Nazis used poison gas to kill millions of Jews. In more recent times, the Syrian Army has been accused of using chemical warfare against rebel-held civilian population centers. And these are only a small handful of the many instances in which people have used chemical weapons against others. With that as a baseline, is it really unbelievable that the government could use chemical weapons against its own populace in order to influence behavior, manage population, or cause drought or flooding to occur? Point Two: While proponents of chemtrails admit that condensation trails do exist, they point to a difference, that chemtrails, because of their chemical composition, last longer than conventional contrails, which, they say, dissipate more quickly. These longer-lasting anthropogenic clouds are proof, they claim, that chemtrails are real. Point Three: Chemtrail proponents have presented both photographic and video evidence as support for their theory. These included large numbers of barrels with plumbing installed in what is normally the passenger seating area of large airplanes. And additionally, they have used footage of airplanes spraying some substance over an urban area as proof of chemtrail use. Counterpoint: With Point One, while it is true that warring factions have used chemical weapons against rival nations or factions, it is a great leap to go from that kind of war crime to a systematic use of chemical weapons for mind control or other hostile purposes. The scope of such a program and its physical infrastructure would necessarily be so great as to make it impossible to keep such a program under wraps, especially since such an endeavor would be targeting the family, friends and fellow citizens of the very people carrying out the attacks. Point Two is just scientifically inaccurate. 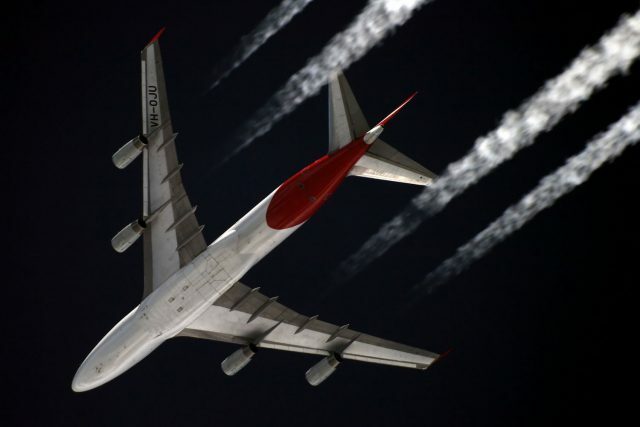 Depending on the weather conditions and the composition of the aircraft exhaust, contrails can be short-lived or relatively stable, lasting even hours. Furthermore, proponents have never shown any evidence that the composition of contrails said to be chemtrails was chemical or biological in nature. And as far as Point Three is concerned, every image and video that purported to show chemtrail activity has been debunked. One showed ballast barrels in the cabin of a jet going through certification flight testing, where water barrels are used for ballast to simulate passenger loads; another video merely showed venturisenerated trails from a departing airliner, and the footage of a plane spraying chemtrails was actually an aircraft dumping fuel in order to make an emergency landing. Furthermore, the supposed logic of chemtrails makes no sense. Depositing chemicals at very high altitudes is perhaps the least accurate, most wasteful and least powerful way to disperse chemical or biological weapons. In Los Angeles in the 1980s, when a dangerous agricultural pest, the Mediterranean fruit fly, or Medfly, threatened the vast agricultural empire of California, the government did indeed spray pesticides (malathion) in urban areas, and it did it at low altitude from helicopters and fixed-wing planes. Conclusion: The spraying of chemical or biological weapons at very high altitudes as a means of managing population, enforcing mind control or otherwise injuring or influencing the populace is unfounded. There is no credible evidence the practice exists; the vast conspiracy it would require would be unmanageable, and the supposed method of dispersing the chemicals would be impractical and ineffective. Finally, chemtrail proponents don’t even know what is supposedly being sprayed, what the purpose of that spraying is, or even who is doing it. In short, the theory of chemtrails is nothing short of a paranoid observation looking desperately for a reason to exist. Then again, maybe I’m one of them. You can write a million articles explaining chem-trails it will do nothing to people who are believers…. It is like telling someone their religion is wrong or telling Trump supporters that he doesn’t lie to them. It was said the most simply by Julius Caesar: Men willing believe what they wish…….. The nice thing about having a homebuilt is that my chemtrail dispenser does not have to be certified, and I can maintain it myself. It’s also lots cheaper. I usually don’t care if someone wants to expend their energies into nonsensical beliefs, it is their right to do so. It’s amazing to me how blunt people are to their own bias in thought that they cannot come to a reasonable conclusion. Where I did take exception was while enjoying a gathering at our local grange a gentlemen came out of the building, pointed to the sky and told a group of children “See those trails up there, those is chemtrails kids” as a matter of fact. Against my better judgement I challenged him on it in front of the kids, much with the counter points you bring and more. His answer was “they’re real, just Google it to educate yourself”. Sad really. In 1963-1967 I was a Lic WX Observer for Pacific Airlines in Chico Calif CIC. I took hourly observation. I would notice contrails from high altitude aircraft spreading and as more contrails from AC these contrails merged and became a cirrus cloud layer. I reported this to the RBL Weather Bureau they just passed it off but I wondered if this couldn’t be changing our WX. At the very least the clouds would thicken and cause a overcast condition occasionally. This would happen during the hot summer months, I rarely saw this in the wintertime months. I don’t believe any of it….for a fact, it’s caused by the Loch Ness monster farting while submerged……everybody knows that !!! What IS the reason that some jet trails last for an hour or more, but most dissipate in a few minutes? Regular trails are merely snow created by the superheating of water molecules as they pass through the engine then supercooled by subzero temperatures of high altitude air upon exit. Nice try. Your so-called “counter-points do nothing to explain how, since these “Contrails” first became visible over most of the U.S.A around 1947, the fact that I and my younger sister were both born with two eyes each? And why, if your “Theories” are correct, did I just happen to be born in 1947, when my brother who is two years older, was born in 1945? I have heard that Barometric pressure has an effect on longevity also? High pressure will let them hang out longer and shorter with low pressure? Lets see, they were trying cloud seeding ever since I was a kid 50 years ago but now its stupid to think they have perfected it. Saudi Arabia brags and has pictures of a King Air they use to spray and control temps, And there have been tests that say whats being sprayed. Numerous videos of them turning it off and on and a 747 that forgot to turn it off landing in Phoenix. The former Secretary of Agriculture for the USA says it is being done unregulated to control weather conditions. So does the former Secretary of Defense for Canada. If you as a pilot cannot tell the difference, Well, go ahead and keep denying. They never sprayed agent orange either. Think again about defending a coverup of the implications most are unaware of. A recent speech by CIA director John O. Brennan at the Council on Foreign Relations mentioned geoengineering, specifically stratospheric aerosol injection. Claim: • CIA director John O. Brennan at the Council admits geoengineering in the form of stratospheric aerosol injection (SAI) is taking place, ie “chemtrails”. Plus, I’ve always been curious… When did we change flight patterns to be perpendicular?